This post is just a little bit of math fun as a break from working on the “river” piece. The other night I was prepping some yarn to mordant and dye for an infinity scarf. 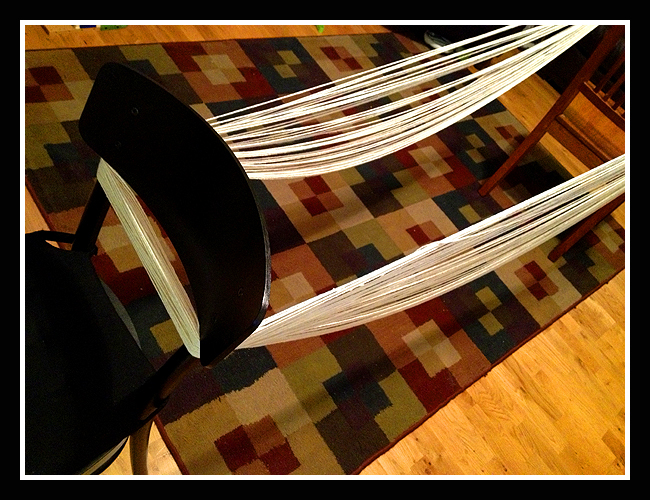 As the plan is to dye different sections of the yarn different colors I had set up two chairs to wind a very large loop. As I walked around and around for quite a long time my husband commented “I wonder how long that is?”. The comment was all it took for me to decide to work it out. Luckily I had everything at hand to work it out. I had an infinity scarf sitting completed so I was able to weigh it. I still had the label for the yarn which indicated how many meters were on the ball and how much it weighed. A quick bit of figuring and I came up with 210 meters of yarn. Then to put the meters in context I compared it to where we live; the yarn for an infinity scarf would go just slightly further than half way around our city block. Just so you know, I’m not completely insane, I didn’t walk the yarn around the block…….I run with a GPS and our block is bang on 400 meters to walk around. ……….and now back to working on “river”.……..I don’t even want to think about how many meters of thread in this piece! 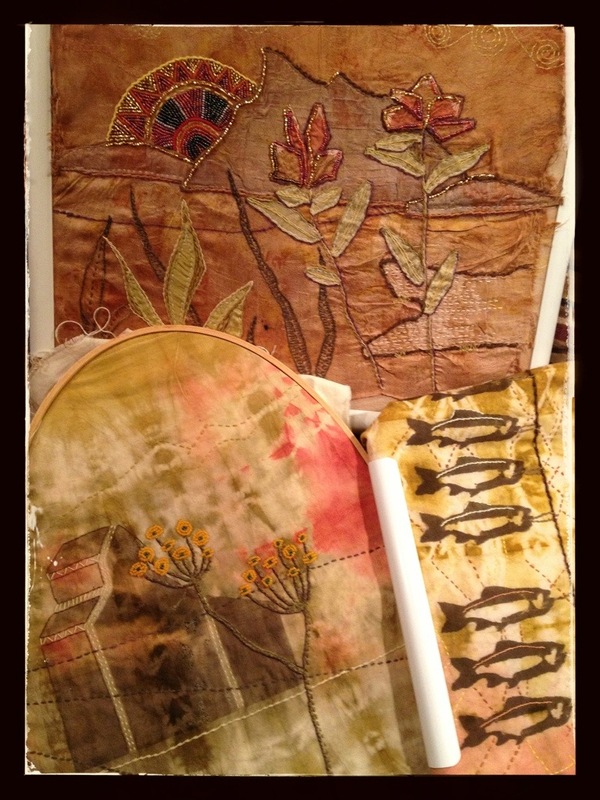 media: silk hand dyed with hand-crafted natural dyes, embellished with cotton, bamboo and silk thread, and accented with glass beads Well ” Flower Garden ” is finally finished, and finished before the submission date…some how. It is a fun piece, a little folk-artsy, a little child-like, and a whole lot of beads. The red beads in the border total just under 2800 beads alone….I didn’t work out how many beads the whole piece contains, I’m not quite that insane. Unfortunately the little pictures in the blog don’t really show the texture, the shimmer, and the detail the piece contains; it is a piece that really needs to be seen (and touched) in person. 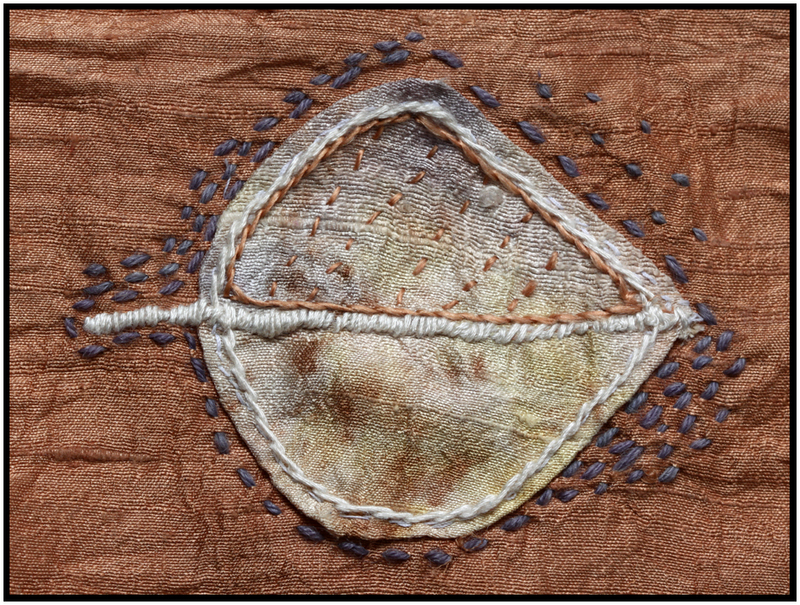 Onion skin eco-print silk leaf on arbutus dyed silk. My decision to work on “little stitchings” has been a good choice of direction. It is allowing me to test different combinations of dyed fabrics together and play around with stitching patterns without making a big commitment. I am discovering some combinations I love, and others, not so much. The eco-dyed onion skin silk is definitely a favorite as is the other “mystery” piece of eco-dyed silk that I am using. I predict there will be a lot more bundling and steaming in my future. Marigold dyed silk leaf on the “mystery” eco-print silk. It is difficult to know how much detail to stitch into the leaves; I am tempted to do more but I am afraid it will be too much once it is all pieced together. Perhaps I should just plan to add more stitching once it is all assembled. Working on the “little stitchings” has become part of my evening routine. Once the children are in bed, my husband and I sit down to watch an episode or two of the British television series “Doc Martin” and I stitch. Downsizing the project has been a good choice. 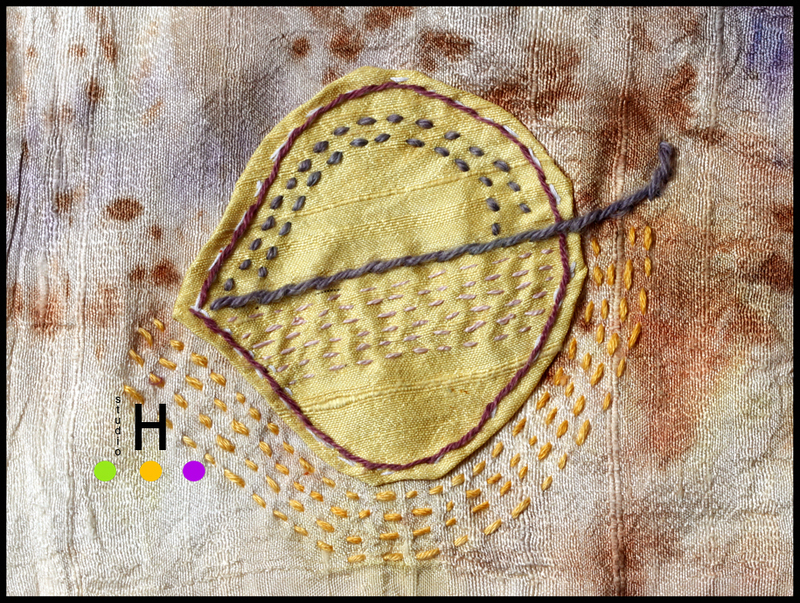 Eco-dyed leaf on arbutus dyed silk. The leaf measures 2.5 inches by 2.25 inches. 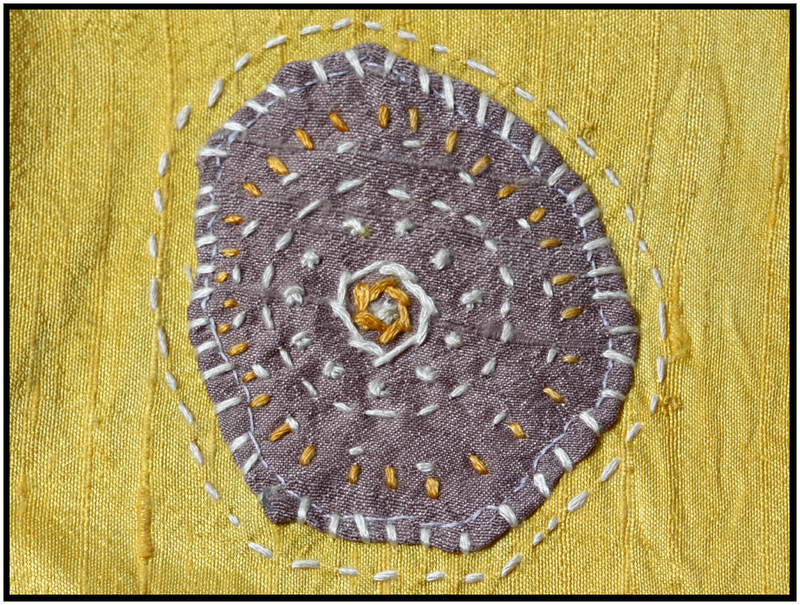 I have been thinking a lot about my approach to fibre art recently, perhaps I am thinking mostly about the logistics. I have been wanting to do a larger piece, but every time I start plotting the piece “real life” gets in the way. The other night I was really frustrated as to why I am not getting around to working on a large piece and then I reflected on what the last seven weeks have been like. We’ve had: seven people with the flu, followed by a toddler with an ear infection, Christmas, 10 days away on a trip, a week with a child with high fevers, a child who may or may not have a broken arm (we need a second x-ray), and we currently have two children again with high fevers……plus running a photography business on top of all that. I think I have figured out why not a lot of fibre art is happening (yeah, call me Sherlock!). So I have decided to change my plan of attack. Blackberry dyed silk on marigold dyed silk. Circle is 2.25 inches in diameter. I have come up with the idea of “Little Stitchings”. I have decided to work on small compact pieces, no bigger than 6 inches by 6 inches, with the idea of being able to eventually combine them into larger pieces. 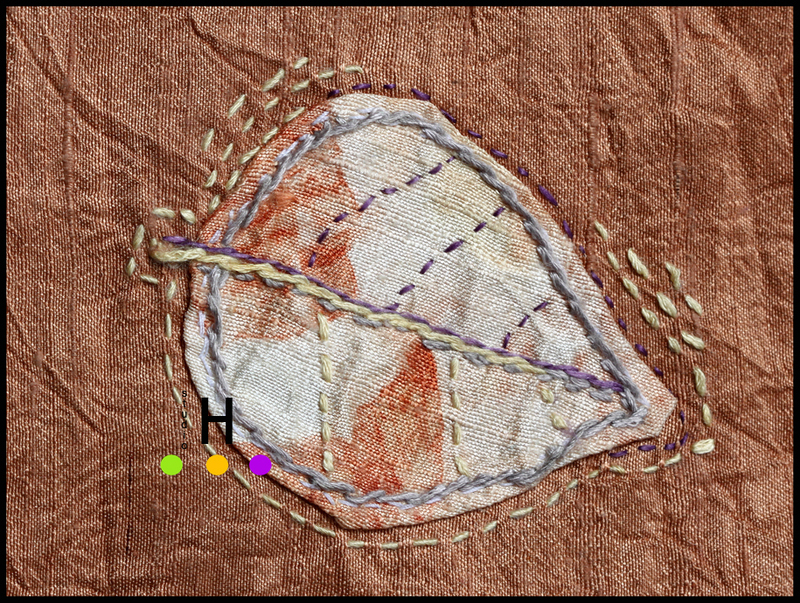 I have started on stitchings geared towards two different final projects, one with geometric shapes and one that is nature based. Both projects are using naturally dyed silk and eco-dyed silk fabric, with the stitching threads being silk and bamboo. 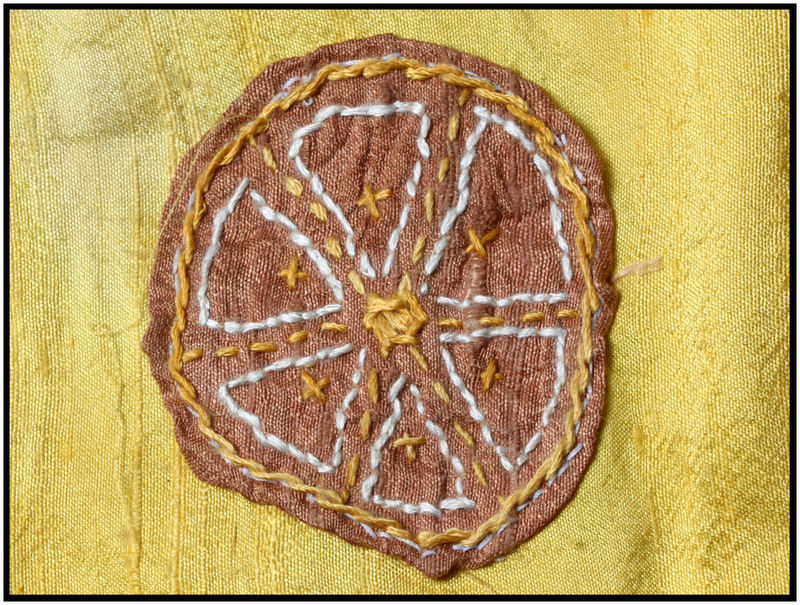 Arbutus dyed silk on marigold dyed silk. Circle is 2.25 inches in diameter. I think this new approach will allow me to feel like I am accomplishing more, plus it will give me the freedom to work on the pieces anywhere due to the tiny size. I can see a lot of stitching going on in the school parking lot as I pick the children up from school!